I really enjoyed the first book in this series, Ruby Red. I liked the non-dizzying time travel and the fun, spunky girls. I loved the broody, complex, and a bit confusing book-boy Gideon. The whole Guardian organization, the mystery of Lucy and Paul, and the smoldering, slow-building romance were a perfect blend and super enjoyable to read. 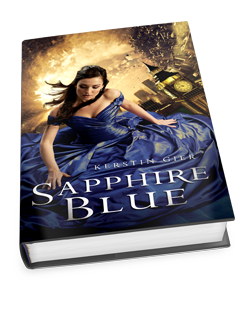 Sapphire Blue picks up at the very instant that Ruby Red left off without much of an intro. So, it took a bit of effort to get back into the story and place myself back in the world of this trilogy. However, once I did, I thoroughly enjoyed it. There was so much more character and world building. Gwen is such a fun leading lady. And Gideon…hmmm…Gideon needs to figure out what he wants already. The way the story ends was really fun too…or not fun…or something. It made me want to jump right into Emerald Green…which is exactly what I did. So, in short, I would definitely recommend this series as a whole (at least so far). The endings make it a bit difficult to allow time to pass between reading, but if you have the time to read all three consecutively, I think it would be the perfect way to read these super fun books.